Leverage new source of alpha for quantitative investment models. ESG is largely uncorrelated with other quant factors, and incorporating it is additive to most existing strategies. Create screens for a given universe or sector to identify desirable and undesirable companies based on ESG values. Uncover opportunities using ESG performance and momentum scores. Examine company scores on material ESG categories based on the Sustainability Accounting Standards Board (SASB) industry specific framework. 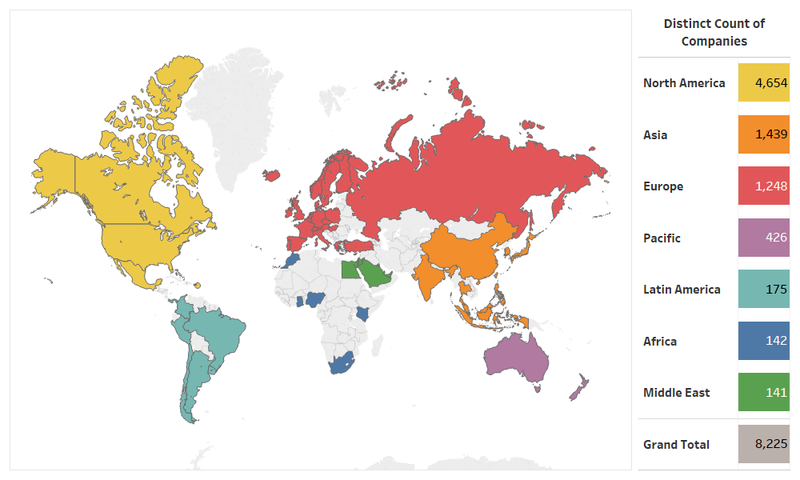 The Truvalue Labs’ Insight360 DataFeed covers publicly-traded companies worldwide, including constituents of major indices such as the S&P 500, Russell 3000, MSCI All Country World Index and others. 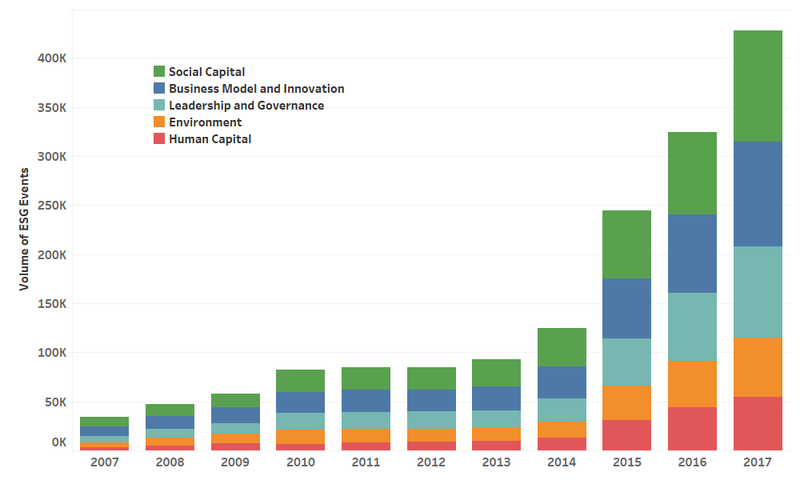 Out of this universe, over 8,000 distinct companies have an ESG risk exposure with history going back as far as 2007 on a daily basis, as shown in Figure 1. The artificial intelligence technology behind Insight360 augments human decision making by extracting meaningful sustainability signals from large volumes of unstructured data. In order to calculate Truvalue Labs’ Scores, ESG data must be processed and categorized. Figure 2 highlights the massive volume of ESG information tracked and scored. 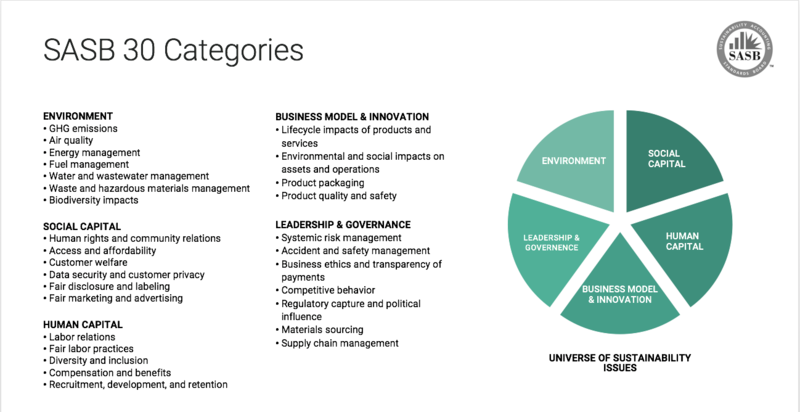 The Insight360 DataFeed classifies events into the 30 categories defined by the Sustainability Accounting Standards Board (SASB). These 30 categories are shown in Figure 3. Truvalue Labs is the first solution that delivers analytics on ESG factors identified by the Sustainability Accounting Standards Board (SASB) as having a material impact on company value by industry and sector. Firms can combine any of the 30 material categories to create their own unique composite score. With a focus on both positive ESG behavior as well as controversies, Truvalue Labs goes beyond risk identification by uncovering opportunities hidden in unstructured data. Unlike traditional ESG data sets that are focused on annual ratings and periodic corporate disclosure, Truvalue Labs monitors company ESG behaviour at the speed of current events. This enables investment professionals to more efficiently incorporate material, market-moving information into their investment decision making process. The Insight Score measures a company’s longer-term ESG track record. The Pulse Score measures the near-term performance changes that highlights opportunities and controversies. The Momentum Score measures a company’s ESG behavior trend over time. The Volume Score measures the information flow or number of articles about a company. This is represented as both a daily figure and an aggregate value over the past 12 months. The scores above are calculated for each of the 30 SASB categories. There are also aggregate scores based on all categories and only those categories which are material for each company. Finally, there is an industry percentile score which provides the company’s materiality insight ranking of the companies within the SASB SICS industry the company has been mapped to. All of these scores help to identify both opportunities and risks and uncovers the material ESG factors that drive company value. Truvalue Labs’ timely ESG data can be used to construct and monitor a portfolio of top ESG performers. A recent study by Dr. Stephen Malinak, Chief Data and Analytics Officer at Truvalue Labs, finds that companies with strong information flow (the TVL Volume Score), good overall ESG scores (the TVL Insight Score), and positive ESG momentum (the TVL Momentum Score) outperform the S&P 500 and Russell 1000 benchmarks over a ten-year period (2008-2018) in terms of investment performance. For example, health care company Humana (HUM) is ranked highly in a screen based on these factors. The Insight360 DataFeed provides insight into Humana’s performance as events unfold over time. Figure 5 shows the Insight, Momentum, and Volume Scores for Humana, together with its industry percentile, reflecting its performance relative to industry peers. Humana scores above the neutral score of 50, representing overall positive and improving performance. You can use the underlying data at the category level to understand what drives these scores and how the company compares to its peers over time. It is worth focusing on the ESG topics that SASB identifies as material for a managed care company like Humana. These include the five categories (out of 30 available categories) shown in Figure 6. Humana has strong positive momentum in a majority of these categories, with the “Access and Affordability” category impacting the overall score most significantly as shown by the “Impact % TTM” value (defined as the TTM Volume Category Score divided by the TTM Volume total of the material categories). This explains the company’s overall positive Momentum score. The company has negative momentum on the “Fair Disclosure and Labeling” category; however, that is not a significant contributing factor to the overall score since it only represents a 2% impact. One could now track the company’s ESG performance over time for any combination of categories. Figure 7 below shows the overall ESG performance over time for material categories. The figure shows that Humana not only has positive Momentum (indicated by the upward sloping solid Insight score line) but it has also been far outperforming its healthcare sector peers over the previous 24 months, and the gap has been increasing, as can be seen by the purple and green solid lines. The bars at the bottom of the chart represent a steady stream of information flow (daily volume) on the company, which can also be an interesting signal by itself. Drilling down further, Figure 7 also shows a historical timeline of daily Pulse scores, a short term measure of both positive and negative ESG incidents. Figure 8 below highlights the best and worst companies in this industry, as grouped by their Pulse and Insight scores on May 30, 2018. Firms like Magellan Health and WellCare Health Plans have high scores (all above the neutral value of 50) across all three metrics. In comparison, firms like Molina Healthcare, Tivity Health and BioScript score in the bottom quintile. As “Access and affordability” is an important material category for the success of health care companies. Molina Healthcare was in the news last year when it pulled out of several important markets and cut jobs resulting in poor scores. Meanwhile, during this time, Humana was steadily improving its performance on Access and Affordability, which continued into the next year as shown earlier. For more information on Truvalue Labs’ Insight360 DataFeed, including case studies, white papers, and additional research, please visit the partner page on the Open:FactSet Marketplace. If you have any questions please contact us at OFSupport@factset.com.